Historic building converted to condominiums in 2004. Units feature hardwood floors, urban views and tax freeze through June 30, 2019. There are 2 listings found for The Embassy. The Crown Jewel of The Embassy. This south-facing penthouse is one of only two units with covered balcony and views of the city and west hills. Large living room with French doors to dining room. Delightful kitchen with hex tile counters & added office nook. Hardwood floors, large bedroom, upgraded bathroom and walk-through closet with Murphy bed capacity. Deeded parking, storage space, courtyard, gym and free laundry. Walk Score: 98. 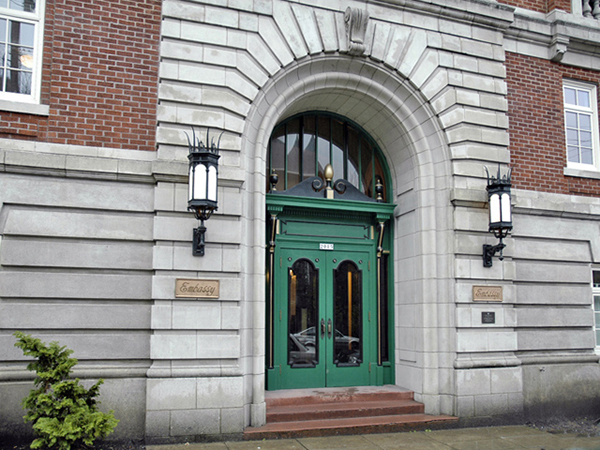 Open Hse Sat, 4/20 10a-12pNW PDX Pied-a-Terre in Historic Embassy! Stunning, sunny, So. facing crnr unit. Updtd w/sultry antique French light fixtures, dk hrdwd flrs & fresh paint. Kitchen has a new Viking range & coveted dishwasher. Charming bath incl a refinshd tub, period approp. fixtures, blk hexagon flr tiles w/ wht subway tiled shwr. Deeded prkg, storage space, courtyard, gym, bike storage & free laundry. This is living the dream!